Like all content marketers, you are probably crunched on time and always looking to trim unnecessary processes. But you shouldn’t think of personas as one of those “nice-to-have” tools that will be abandoned as soon as you build them. Having documented personas, even in their simplest forms, will not only help you crystallize your ideas, but also serve as a single version of truth for everybody creating content for your organization. If you are like the 41% of B2B and 38% of B2C marketers who are prioritizing better understanding your audience, stay tuned. We’re here to take the stress out of persona development – and help make them as practically useful as possible. 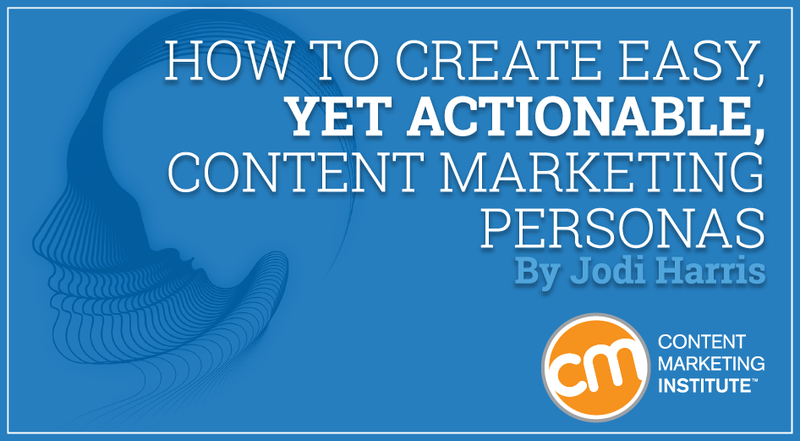 Read on to learn the essential steps for creating and applying content marketing personas more successfully. As defined by Ardath Albee, a buyer persona is a composite sketch of a key segment of your audience. For content marketing purposes, you need personas to help you deliver content that will be most relevant and useful to your audience. Furthermore, you personally may have a handle on this information, but does everybody who is creating content in your organization have that same vision of your ideal audience? Documenting your personas, even if it is done in a quick way, is key to keeping everybody focused on the same audience. RECOMMENDED FOR YOU: Ardath Albee has developed a dedicated training course on how to develop audience personas. Visit CMI’s Online Training and Certification Program page to view her lesson for free, as a preview of our full training program. Are personas the same as demographic profiles? When you think of your audience, you may first think of it in demographic terms. Naturally, you’ll want your personas to include the most relevant demographic data points (e.g., business type, job title and function, geographic location). However, while demographic data is used primarily to group audience members by what they have in common, personas enable marketers to hone in on key differentiators that your business can tap. For time-crunched content marketers, this ability to focus in on only the data that will help make your content more relevant and actionable is invaluable. 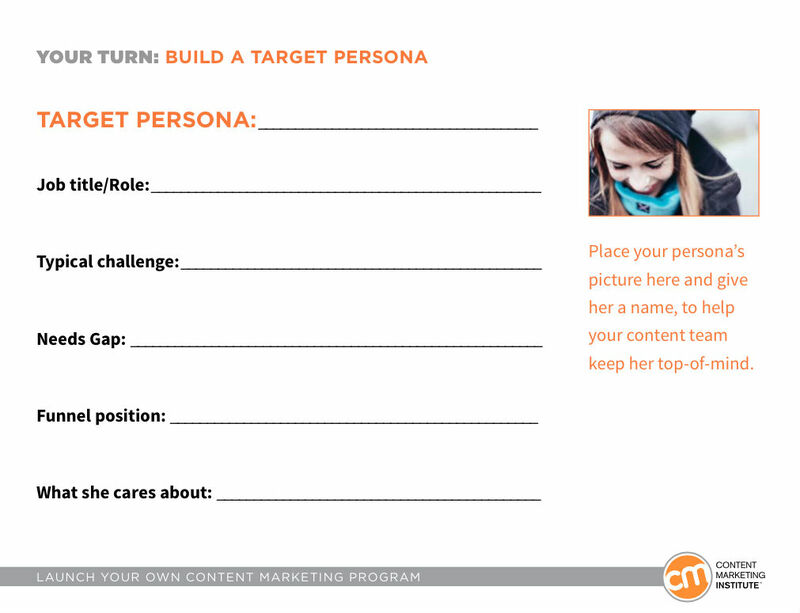 How do you build a content marketing persona? What might her typical workday look like? The answers serve as the foundation of your persona. Consider the specific roles and responsibilities she might have in relation to your business’ buying cycle – and how those needs might evolve. What challenges/frustrates her most about her job? What needs gaps might she be looking to fill to alleviate some of that frustration? Is she a primary decision-maker or does she need to run things up the chain of command? If it’s helpful, consider using any key details on her content preferences and consumption patterns that you have available. How does she prefer to access information? Are there content formats with which she prefers to engage? Who does she trust to provide the content she consumes? Industry analysts? Vendors? Thought leaders? Friends and colleagues? Are there internal or external events that might trigger certain content consumption patterns? The answers to these questions can help you identify ideal content topics, types, and channels that may move her closer to making a purchase. 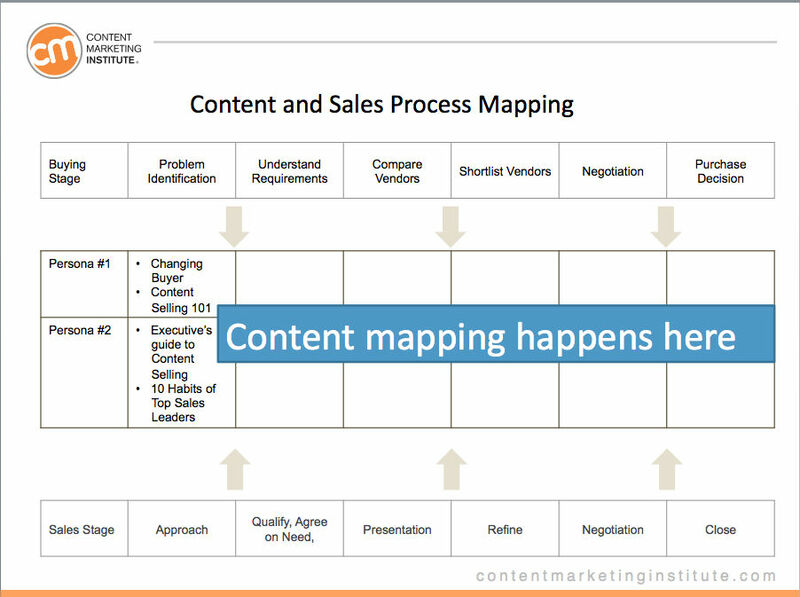 However, it’s essential that you consider how your content marketing efforts might benefit from the information you gather. Remember: If you don’t have a specific way to turn a particular data point into an actionable customer insight, it’s best to leave it out of the persona. TIP: You can fill in the blanks in the template below (from CMI’s workbook: Launch Your Own Content Marketing Program) with a summary of the key information you’ve gathered for your persona – or create a similar form with the information that’s most useful for your business. Remember to add images and give names to your personas to help you and your team think of these buyers as real people – not just a piece of business. Lastly, remember that it’s critical to document your persona, and share it with everybody on your team. To help keep your ideal audience member front and center, consider printing and placing it in a visible spot so her needs are continually top of mind. How do you source accurate customer data for your personas? A/B testing: Testing your existing content can provide quantitative insights into what works for your target audience and what doesn’t. Progressive profiling: This technique uses smart lead forms and directed questioning to gather audience insights that grow more detailed over time. Current content consumption patterns analysis: Analytics data such as page views, time on site, downloads, newsletter open rates, and bounce rates can provide insight on where your audience’s top needs and interests lie. Sentiment analysis application: Social listening tools are getting better at assessing consumers’ emotional states to contextualize social chatter in a way that’s relevant to your business. Conversations with your sales team and/or mining your CRM system: These team members are on the front lines of customer interactions, so chances are they have plenty of insights they can share. One-on-one interviews: Nothing beats the ability to get information directly from your customers and prospects. The number of personas will ultimately depend on the number of distinct audiences you intend to target with your content marketing. But keep in mind that just because two target consumers serve different functions in an organization or have different reasons for considering your company’s solution doesn’t necessarily mean you need to create a separate persona for each one. In her Content Marketing World 2014 presentation on personas, Adele Revella contends that the only reason to build a new persona is when it allows marketers to create something more effective, more compelling, or more persuasive for a buyer. As Adele explains, even if you have two distinct audiences with two distinct buyer profiles (e.g., the CMO and the CIO of a company), if their decision criteria or insights (i.e., those turning-point factors instrumental to winning them over) are primarily the same, you may be able to use one persona to create content that will meet the needs of both buyers. However, if you uncover an insight that resonates with one group but not the other, you should consider developing a distinct persona around it as it represents an opportunity to gain a content marketing advantage. Remember, as Joe Pulizzi points out, it’s incredibly difficult to monetize an “audience of everybody.” He cautions that the more audiences for whom you need content, the more you risk spreading your resources too thin and watering down what you are able to create. This reduces the potential impact of your content and makes it more difficult for your business to achieve its marketing goals. 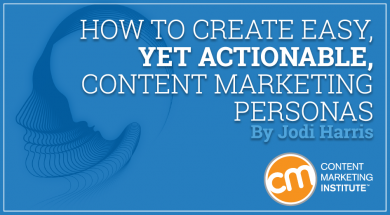 So, it may be best to focus your content efforts on one audience first – ideally the one you need the most help engaging – and then incorporate other personas after your content marketing pilot program has found its footing. Personas need to be updated: Once you have built your core personas, you’ll likely be referring to them often – even for years to come. The problem with this, though, is that you may be continuing to rely on the information long after it’s lost its relevance. Personas should be shared with other departments: While developing personas is primarily a marketing exercise, make sure to document and share this information with other teams in your organization. In particular, it may be worthwhile to share your personas with your sales team, as well as with any new hires in your company – personas can help them become acquainted with your customers and prospects on a deeper level. But remember: In the age of social media, anyone in your organization could be engaging with potential prospects and customers, so it’s useful for everyone in your organization to be working from the same information. TIP: Consider creating two versions of you persona: a detailed version for content creators and marketers, and a shorter version for the rest of the organization. 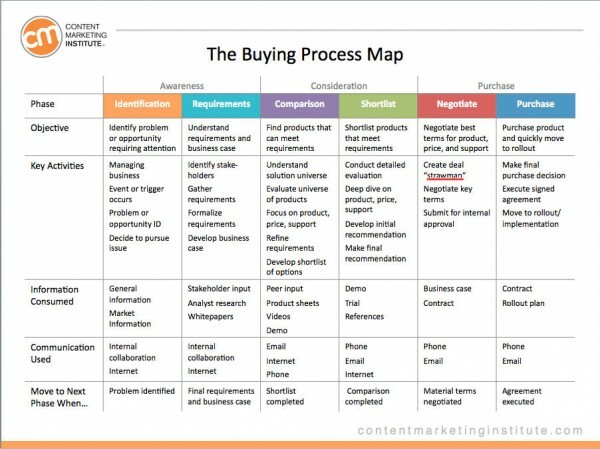 Map personas to the buying process for more strategic content creation: Your personas provide a snapshot of who your buyers are and where they are in their buyer’s journey. But they don’t necessarily tell you how their content needs might change as they progress to the next phase of that journey. That’s where the process of mapping can help. Do you have additional tips for developing and working with buyer personas? We would love for you to share them in the comments below. Have additional questions on creating and leveraging buyer personas? The CMI Online Training and Certification program provides detailed guidance on all the processes involved in developing and deploying content marketing successfully. Learn more now.